The technology was developed in the 90’s as a response to patented calcium sulfonate complex greases and the fact that these types of products generally had problems with sub standard lubricity. 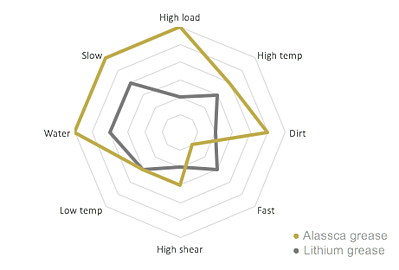 The Alassca complex is made by an exclusive and unique co-crystallization process between a lithium based component and a sarcosylic calcium component. The active components are attached to the soap structure instead of being dissolved in the base oil and, as such, are immediately available to application surfaces. The lubricity of the system is ensured by the lithium based component in the physical matrix of the thickener system. This is increasingly important at lower temperatures, where oil released from the thickener is reduced. The Alassca grease combines the properties of the lithium complex thickener, such as high temperature performance, mechanical stability and improved pumpability with the characteristics of water resistance and extreme high load carrying ability found in calcium sulfonate greases. The technology is the prime choice for wet, dirty and highly loaded conditions, especially at low speed and low temperature.